After your visit to the magnificent city of Colchester we will take you to Green Island Gardens in Ardleigh. Professionally designed by its owner Fiona Edmond, the land is laid out as a series of structured gardens displaying a huge range of unusual trees, shrubs, perennials, and bulbs - 'A Plantsman's Paradise'. 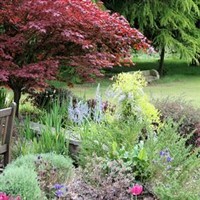 Surely one of the best gardens open to visit in Essex. Featured in Country Living February 2019, and recommended in Great British Gardens 2019 and Essex Days Out. During your afternoon visit you will be treated to tea/coffee and homemade cake. There are plant sales on site too.